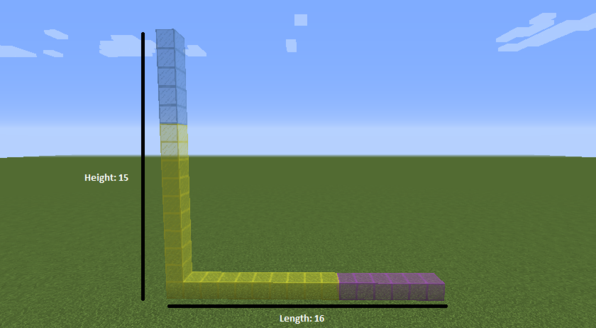 In this lesson, students will learn how to multiply multi-digit numbers by building multiplication structures in Minecraft using partial products. Students should have had practice adding and subtracting multi-digit numbers. Although we ran this lesson with a 5th grade class and had numbers up to the thousands, the problems can easily be adjusted to have students multiply and solve for two- and three-digit numbers. By creating these multiplication structures, students are able to see the answer first and then understand the process of how to get at it through partial products and knowledge of base ten. 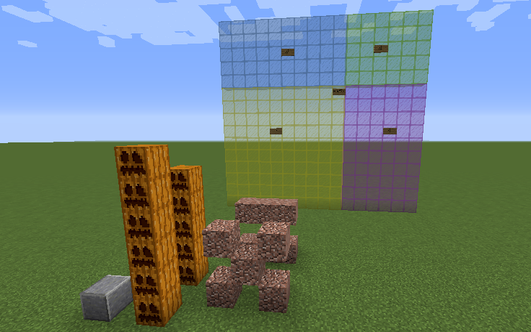 While building these structures in the game may take more time in the game than on paper, there is real educational value in students creating their own times table and figuring out how the sums of the part equal the whole. Calculate the product of a multi-digit multiplication problem by building out one number horizontally and the other number vertically, and then creating a square structure. Construct a multiplication structure that clearly shows partial products. Prove, through articulation and showing of work, how partial products is a process of solving multi-digit multiplication problems. Note: If students are not familiar with place value and you want to go straight into multiplication, you can skip this section and have students just write down the problem on a sign. 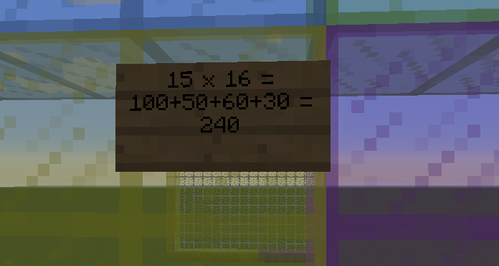 Once students are able to read and interpret values by place structure, write down multi-digit multiplication problems on the board (e.g. 16 x 15). This is the set up for the multiplication problem, 16 x 15. Note how the places values for the number are lined up. The granite blocks are used as a multiplication and equal sign, and are placed on the right side. Go through the first problem together with students. We’ll use the problem ’16 x 15′ as an example. First, write down ’16 x 15′ on the board. 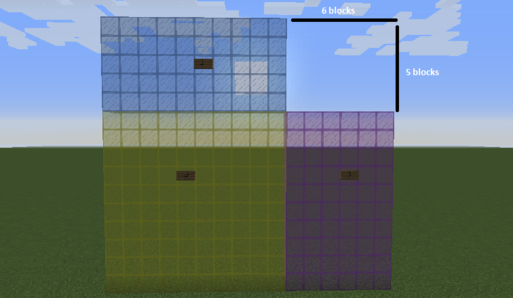 Now put down 16 blocks horizontally in Minecraft. 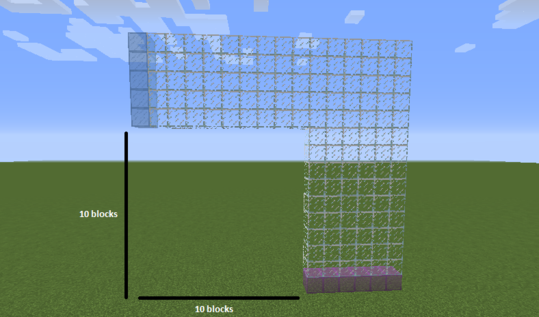 Then, place 15 blocks vertically, creating an L-shape structure (image below). 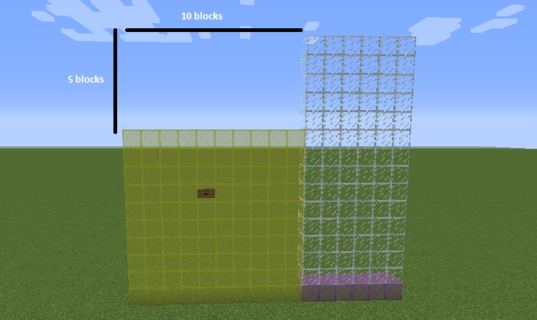 Note that you’ll only have to place 14 blocks vertically to make 15. 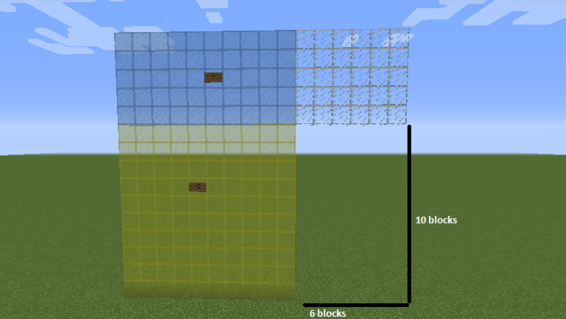 Note that we use yellow stained glass blocks for the first ten blocks of the width and height and different-colored blocks after that. This allows students to easily visualize the numbers. Explain to students that this is actually the answer to the multiplication problem! By counting the number of blocks, they’ll get the answer. Explain that using partial products will get us to the answer of the multiplication problem. Have a student volunteer get up on the board with a marker, ready to write down the partial products. Note: With partial products, we’ll be asking students to multiply from the tens place first instead of the ones place. This aligns well with the Common Core Standards of focusing on operations in base ten. 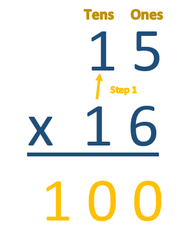 STEP 1: Multiply the tens place value of the bottom number with the tens place value of the top number. Ask them what that equals. 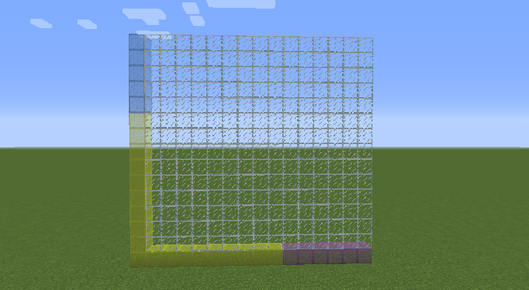 Now count 10 blocks horizontally and 10 blocks vertically on the bottom left and destroy the area of that length and height. Ask students how many blocks you’ve destroyed (image below). They should say, “100. Fill it in with the yellow stained glass blocks and use a sign to show work. This is the first partial product. 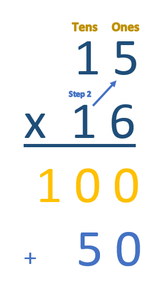 STEP 2: Multiply the tens place value of the bottom number with the ones place value of the top number. Ask them what that equals. 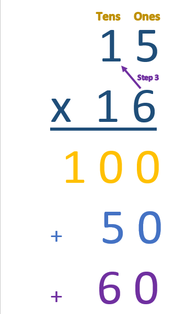 STEP 3: Multiply the ones place value of the bottom number with the tens place value of the top number. Ask them what that equals. Now fill it in with magenta stained glass blocks and use a sign to show work. This is the third partial product. STEP 4: Multiply the ones place value of the bottom number with the ones place value of the top number. Ask them what that equals. Fill it with lime stained glass blocks and use a sign to show work. This is the fourth and final partial product. STEP 5: Inform students that the sum of the partial products is the answer to the multiplication problem! Have a student add the partial products on the board, and create a sign to show work. Take a step back to show the set up of the problem and the final partial product structure (image below). Keeping the partial product structure directly behind the set up of the problem allows for students to show their work and the facilitator to easily check for understanding. If necessary, go through more examples with students until they become familiar with the method of multiplying multi-digit numbers with partial products and creating the structures.